Posted by Jake Rome on December 22, 2011; This entry is filed under Running. 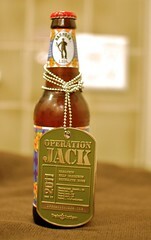 Thank you for signing up for the Operation Jack Marathon & Half Marathon, http://ojmarathon.com . Please read the race instructions below. The race begins Monday Morning (December 26) at 7:30 AM in Manhattan Beach near 4498 The Strand. There is an optional early start (marathoners only) at 6:45 for athletes that need a little extra time. The time limit to finish is 1:30 PM. You can connect with your fellow runners by liking us on Facebook. Plan to arrive by 6:15 (early marathon starters) and 6:45 (everyone else) to allow time to park & pick up your bib. An interactive Google Map of the course, including aid stations & restrooms is available, http://goo.gl/ezW7c . It is also embedded below. We recommend that runners & spectators park for free for 8 hours or more at Verandas, 401 Rosecrans, Manhattan Beach, see map: http://goo.gl/qo0XA . The parking lot is about a 1/2-mile from the start of the race. The lot will open at 6 A.M.
Alternatively, you may park in metered spots and pay $1.50/hour for up to 5 hours in the El Porto parking lot, located at the west end of 45th St in Manhattan Beach, see map: http://goo.gl/MwosN You’ll need to bring lots of quarters. The lot opens at around 6:15 A.M. If you are taking the highway to the race, exit the 405 at Rosecrans and head west about 2 miles. Verandas is at 401 Rosecrans. Park for free, walk west down the hill until you reach The Strand along the beach. Proceed to the northern end of the parking lot. You may also continue, turning right onto Highland. Turn left on 45th St., the last street before the Chevron station. Park in the lot, feed the meter and proceed to the start area. Bib pick-up will take place at the start line, adjacent to the north end of the El Porto parking lot. Bib pick up will begin at 6:00 AM and will continue until shortly after the race begins. THE RACE IS SOLD OUT. THERE IS NO RACE DAY REGISTRATION. The race starts just several hundred feet from residences, so we ask that all runners be respectful of these folks. There are two restrooms in the El Porto Parking lot, one near Rosecrans & one close to the start line. There are also a half-dozen restrooms the first 4 miles of the course. Use only the restrooms! The entire race is run along the South Bay & Ballona Creek Bike Paths. Runners need to share the road with cyclists, joggers, skaters and walkers, so please bear right while running. Before the race begins, do not block the bike path as many cyclists will be passing through. At about 7:25 we will ask runners to line up by expected pace on the bike path. The first mile of the race will be very crowded and there is not a lot of room to pass. Follow race instructions, and make sure that you line up according to estimated pace to avoid being trampled or elbowed during the start. Within the first mile, race volunteers will ensure runners stay on the right half of the bike path. Follow all instructions from race organizers. The Hermosa 24 is an ultramarathon & relay held on the soft sand between the Hermosa Beach and Manhattan Beach piers. Last year nearly 100 runners participated, running through the night and camping on site while watching the World Record be set for the 2nd year in a row. Collect your team & sign up today at: https://www.hermosa24.com . The race is essentially flat, with the biggest obstacle a 20-foot hill. There are aid stations at the start, 2.3, 4.7 & 6.5 miles where water, Powerade and GU products (energy gels or chomps) will be available. There are restrooms for the first & last 4 miles of the out & back course. As noted above, the bike path is open, so share the path with the cyclists, skaters, walkers & runners enjoying their morning exercise. There will be signs marking the first 6 miles, and these will include approximate mileage for the return leg & 2nd lap of the marathon. There are only two forks along the route. The second aid station, at mile 4.7, is at the entrance to Ballona Creek. On the way out, turn right and 100 feet later turn left to go over the bridge, then turn right and run along the jetty. Continue straight, staying on the Ballona Creek bike path and do not turn left towards Venice. You can view more of the course detail at MapMyRun. Results will be posted shortly after the race at http://ojmarathon.com & Gemini Timing within a day or two. Supporters are welcome to park at Verandas and watch the start & finish of the race. There are also many lots along Dockweiler Beach where you can park and be on the course a minute later. The best place for spectators is near the 2nd Aid Station, at the Pacific Avenue Pedestrian Bridge. in Playa del Rey. Plenty of time to watch the start, see your favorite runners go by twice & get back to the finish. There will be food & snacks available after the race. Half marathon awards will be presented at 9:35 (subject to change) and marathon awards at 11:30 (subject to change). Trophies will be given to the top 3 overall men & women in each race, and age groups will be posted in 10 year increments. Plenty of food is available nearby, with a couple dozen restaurants on Highland Ave. between 33rd St & 45th St.
Food will be provided for the volunteers as well as marathon finishers starting at 12 Noon. We’ll hang out near the timing clock or the beach adjacent. Celliant is a revolutionary technology that harnesses the body’s natural energy through the use of minerals and fibers. Products containing Celliant have been clinically proven to increase blood flow and blood oxygen levels in the tissue and help balance temperature. Learn more at: http://www.celliant.com/ . We have 2 professional photographers that will be volunteering at the race, photos will be available at SurfDaddy Photography. If you donate $8 now, you can download 10 medium resolution photos (1 megapixel) for sharing. Donate $20 now & you can download 10 high resolution photos (10 megapixel) for printing at any size. If $250, is donated all medium resolution photos will be free, and if $1000 is donated all high resolution photos are free. If we don’t get any photos of you, please request a full refund. Prices will go up after the race, so jump on this deal now! More details: http://core4you.org/2011/12/free-the-photos . The Village Runner, located less than 2 miles from the race finish, has been a great supporter for the past 2 years. 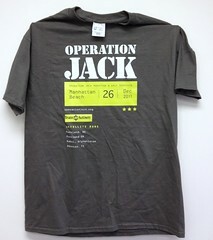 This year they have offered all Operation Jack Marathon & Half runners a $5 off $25 coupon printed right on your race bib. It’s good anytime, but if you’re visiting Manhattan Beach I highly recommend heading to 1840 N Sepulveda Blvd, Manhattan Beach, CA 90266 and buying some great gear after the event. Additional donations are welcome! Please visit http://ojmarathon.kintera.org/ and support your favorite runner. You’ve really got to check out our medal & t-shirt. These are nicer than what you’ll get from a lot of major marathons. Click for full size pics. Beer not included! The Operation Jack Marathon has gone global! For the 2nd year in a row, the Operation Jack Northwest Challenge, a timed race of up to 6 hours, will be held in Portland, Oregon. Also returning for 2011 are the satellite runs. You can still sign up at http://ojmarathon.kintera.org/ and you’ll get the t-shirt & medal shown above. New for 2011 are the Houston edition with about 30 runners, and perhaps most awesome of all, the Kabul edition which has already attracted 20 runners and raised more than $600 (and counting). Good luck! Oh, and if there’s a tsunami, all you have to do is turn east & keep running!